Peace talks follow a war. Why not hold those talks first and skip the war? Donald Trump, who boasts of his art of the deal, said on May 1 he would be honored to meet with North Korea’s leader. Now he accuses the North of “very, very dangerous behavior,” contemplating “pretty severe things” as the military provides “options.” And the top U.S. general in South Korea, Vincent Brooks, warns he can commence war at any time. What changed? Moon Jae-in won election as South Korean president in May, upon promising better relations with Pyongyang. On July 4 the North announced its launch of a long-range missile. Is our military more worried about the North attacking America or about peace displacing us from Korea? Military’s “options” probably don’t include a peaceful solution. But it’s the only sure way to avoid disaster. The 1950–53 Korean war killed millions — without nuclear weapons. If Trump still believes in his deal-making skills, let him go to Pyongyang, a la Nixon to Beijing. He’ll be welcomed. Talks with North Korea could achieve compromise, as in past years. Both sides might halt displays of force: Northern missile tests and U.S.-South Korean military exercises. North Korea might possibly suspend its weapons development, as we end sanctions and deliver food. Don’t expect Northern dictator Kim Jong-un to destroy nukes overnight. He needs them, not to attack, which means suicide, but to avoid the fate of Saddam Hussein and Muammar Qadaffi. Kim distrusts a nation that overthrew governments in Chile, Guatemala, Iran, Iraq, Libya, and Panama and seeks Syrian regime change. Besides, what moral authority remains after A-bombing civilians and making thousands of huger bombs? Trump reaffirmed Obama’s plan for a trillion-dollar program to “modernize” our nuclear weapons and their delivery system (violating the Nuclear Non-Proliferation Treaty) and — like North Korea — boycotted the UN proceedings for a nuclear-abolition treaty. Heed the proverb, “You catch more flies with honey than with vinegar.” Instead of threatening Kim, try respecting him. He’s a killer, but so is Donald J. Trump, who as candidate repeatedly promised peace yet as president delivers intensified war. 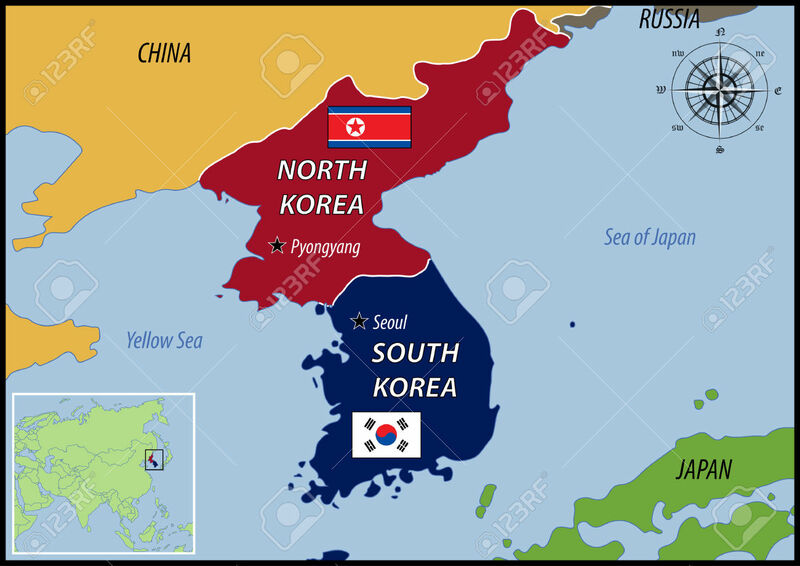 Stop treating South Korea as our puppet and let South talk to North. Trump’s icy attitude toward China melted after his meeting with President Xi Jinping. A Trump-Kim meeting would let the Korean people breathe easier. Harry Truman, who started our Korean war — and the unconstitutional doctrine of presidential war-making. War was his first resort, and it brought only disaster. General Brooks is prepared to launch a war at any time, by his (July 4) statement. Only “self-restraint” keeps us from attacking, a choice we can change at any time. Combat is the military’s stock in trade, but a general’s function is not to drum up trade, e.g. to encourage war by provoking an adversary with threats. Our armed forces are supposed to be under civilian control. Does Brooks speak for Trump? Has Trump left him free to talk and — worse — to act? Whether or not to commit aggression may depend on a leader’s whims in a lawless dictatorship, not in a supposed nation of laws, under a constitution. On Truman's orders, young men — many of them draftees — were shipped to Korea to kill and, for tens of thousands, to die. This is an artist's view of a bayonet charge. Describing our supreme law, Hamilton wrote that the president as commander-in-chief is merely “first General and Admiral” (The Federalist, 69, 1788). But “it is the peculiar and exclusive province of Congress, when the nation is at peace, to change that state into a state of war” (“Lucius Crassus” 1, 1801). Note that the threat of war violates the Charter, let alone the starting of a war. Another law that may surprise Brooks — and President Trump, whose main job is to see that the laws be faithfully executed — is the Pact of Paris, better known as the Kellogg-Briand Pact. Parties pledged to renounce war as an instrument of national policy and settle disputes or conflicts by peaceful means only. Signed in 1928 by representatives of 15 nations, attracting scores of others later, it remains in effect. Frank Kellogg, secretary of state under President Coolidge, and French Foreign Minister Aristide Briand sponsored it. The Senate approved it in 1929, during Hoover’s administration. Its violation became grounds to prosecute Nazi and Japanese leaders for the crime of aggression. 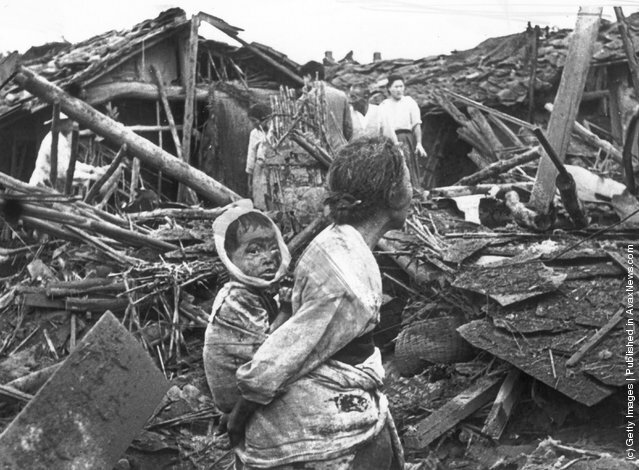 To punish the North Korean leader, for 3 years bombs fell on his people, like this mother and child in devastated Pyongyang. 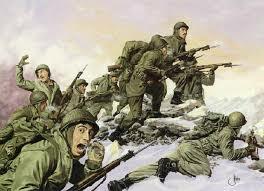 The Korean war lasted three years, 1950–1953, ending in stalemate and armistice under President Eisenhower. A North Korean death toll of 1.77 million, 1.55 of them civilians — a fifth of the North’s population — is attributed to U.S. military sources. Most deaths resulted from U.S. carpet bombings. The South Korean military estimated 991,000 civilians dead, wounded, or missing in the South. Hundreds of thousands of Chinese “volunteers” also succumbed. American deaths totaled over 54,000 (original toll), or some 37,000 (revised Pentagon toll decades later), according to older and newer almanacs. Congress did not authorize war. 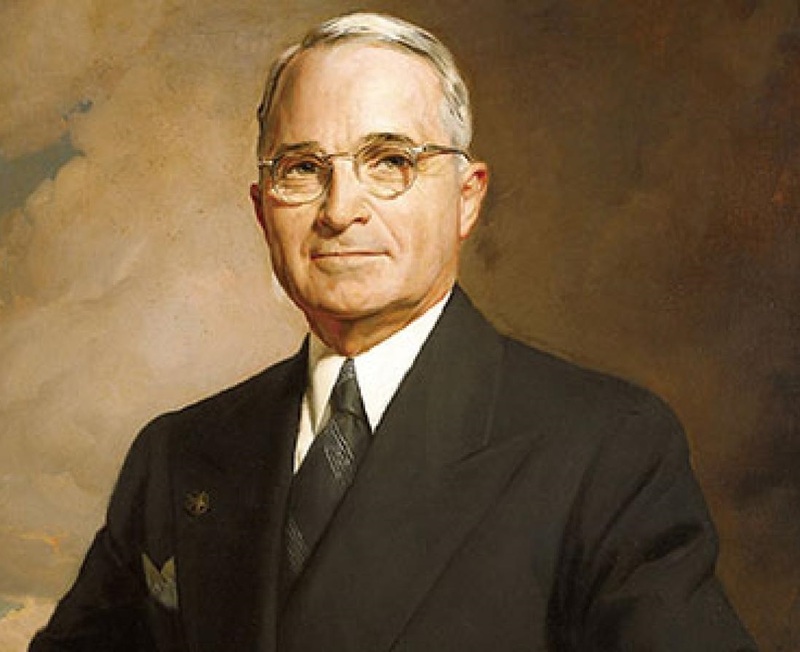 Interpreting a North-South incursion (one of many) as “Communist aggression,” President Harry S Truman — whose claim to infamy then lay in his nuclear annihilation of Hiroshima and Nagasaki in 1945 — acted on his own in dispatching armed forces. Then he got the UN Security Council to rubber-stamp his “police action” in the absence of the Soviet delegation (protesting that Red China was not seated). Few in Congress, notably Senator Robert A. Taft (R-Ohio), dared to challenge the usurping of congressional war power. Some even praised Truman’s “courage” — as though he volunteered to grab a rifle and risk his own life. Had Congress impeached and removed Truman, bringing forces home, not only would countless lives have been saved, but also his high crime of illegal war-making would not have been imitated by subsequent presidents. They included Johnson and Nixon in Indochina; Reagan in Latin America and the Middle East; Bush Sr. in Panama and Iraq; Clinton in Iraq, Yugoslavia, and five other countries; Bush Jr. in Afghanistan, Iraq, and Pakistan; and Obama — the first 100% wartime president — in Afghanistan, Pakistan, Libya, Yemen, Iraq, and Syria. Trump emulates and escalates the lawless carnage in Afghanistan, Iraq, Syria, and Yemen, risking conflict with Russia in Syria. Our “national interest” justifies the loss of lives. It’s up to the commander-in-chief to start wars. Foreign countries are primarily our battlegrounds, rather than people’s homelands. The [online] Atlantic, July 5, expressed another disputable idea: Because an armistice, not a treaty, ended the conflict, Korea “is still technically in a state of war.” No, Congress never declared a state of war with Koreans. Anyway, an armistice can end a war. America formerly celebrated Armistice Day every November 11, marking the end of The Great War. However, in warning of “the potential for catastrophic consequences” of another Korean war, the writer, Krishnadev Calamur, gets no argument here. In The Atlantic magazine, July/August 2017, Mark Bowden tells “How to Deal With North Korea.” Opening alarmingly with an imaginary missile blasting Los Angeles, he sees “no good options,” some worse than others. They comprise (1) “Prevention,” a massive attack, which would succeed but trigger mass killing; (2) “Turning the screws,” a series of lesser attacks, which could provoke an all-out response; (3) “Decapitation,” murdering Kim, very difficult; (4) “Acceptance,” letting him develop nuclear-armed ICBMs while continuing containment efforts, including sabotage and draconian economic pressure. Bowden chooses option 4. All four involve lawlessness.